Who’s having trouble keeping up with new niche perfume lines? I definitely am. I’m even starting to get a little resentful about it. Enough already. It seems like every designer who fancies himself a tastemaker tosses together a branding campaign and a line of “edgy” perfumes. I see two big problems with this. First, good design sense does not mean an experienced nose. Next, a lot of these lines are treading the same ground. They either latch onto an era or cultural mileu (the 1920s, writers, historic figures), or they shoot for the now banal take on naughty, artistic, and hip. We get a lot of sizzle for a gristly burger at a ludicrous price tag. Still, Liquides Imaginaires Saltus has been getting attention lately, so I decided to give it a test run. 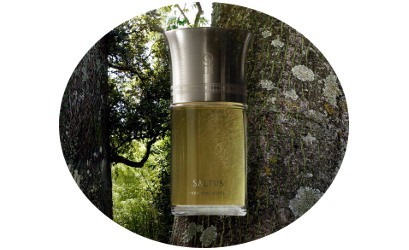 Saltus’s notes include cedar leaves, eucalyptus, camphor, styrax, patchouli, incense, tonka, castoreum and sandalwood. In brief, Saltus is nice and would be a great introduction to an unusual, but not freakish, woody fragrance. The spirit of sap Scents emanating from inside the tree, just under its bark, from its resinous and camphorated vegetal nectar which ensures its growth. An intense perfume that sweeps us along by the momentum of its organic energy. Its spirit: the bubbling vigour of life, the will to live, to jump up, rise, the vital energy of the ambition to grow. Lucky for us, Saltus is less purple than its description. But, as promised, it does smell of resin and camphor, especially at first. Its eucalyptus-y edge softens into a heart of cedar and sandalwood, rubbed with leather. The cedar’s sharpness, heightened by incense, is a great foil to the sandalwood, and castoreum gives the combination depth and an animalic touch without being funky. Saltus's patchouli plus tonka reminds me just a hint of cocoa. As Saltus wears, it sweetens and smooths. Saltus’s blurb describes it as an intense scent, and, as you might have guessed from the list of notes, it is dense. But it has a moderate sillage. It lasts most of the day on skin and a couple of days on clothing, when the sandalwood really comes out. Five years ago, I would have put down my cash for a decant of Saltus right away, but dense, “every base note but the kitchen sink” fragrances don’t appeal to me as much as they used to. They feel too monolithic. There’s no space in them. Also, for this type of perfume I might be tempted to reach for Comme des Garçons 2 Man or a fragrance from Commes des Garçon's Wood series. That said, I’m sure lots of people will want Saltus on their dresser to reach for on cool mornings when their sap just won’t rise and they need some “bubbling vigor of life.” Plus, the bottle really is great. Liquides Imaginaires Saltus Eau de Parfum is $210 for 100 ml. For information on where to buy it, see Liquides Imaginaires under Perfume Houses. 1. To be fair, middle-aged women like me who read a lot of old detective novels and think a great afternoon includes a few hours at Goodwill followed by a martini probably aren’t their target market. Ungrammatical, overblown prose like that blurb from the company takes away my will to live, so the perfume would have to be spectacular to restore my equilibrium, let alone impart the energy to grow, or whatever they said! There’s no real emotion behind those words: you can feel the writer struggling to find another idea to tack on to the last one. Oh dear: what do these people think perfume is actually for? Oh, and please forgive my grouch, Angela: I should have said, but got distracted by my irritation before I did, that your review was, as always, thoughtful, balanced and very useful. Thank you. You don’t have to apologize for blurb-related grouchiness. I completely get it. Wouldn’t it be hilarious–and refreshing–to see a perfume blurb that simply said, “Try this. We think it’s pretty good” ? The perfume marketing equivalent of ‘Eat at Joe’s’. I’d buy that. Spot on. And the “frag-babble” gets me every time. I just want to smell good, not be psychoanalyzed. What’s next…L’Eau d’Freud? Gotta’ dash, I feel my sap rising. Or maybe just my ire. Despite been a little too busy and kind of irritated at a passive aggressive neighbor right now, your comment made me laugh out loud! Good luck! We had the neighbors from hell for years (spiking our tires, firing guns in the pasture etc…) we called their property “Squaller Holler” but they got kicked out thank god, and now our new neighbors are old friends who bought the property. We are thrilled. Thanks! Fortunately, my situation isn’t as dire as yours, but you’ve inspired me to think up a good name for their house. They used to keep a potbellied pig, so maybe the Horrid Ham-let? Or Persnickety Pastures or Trying Towers? I think I’m simply crabby today. Oh, something dosed to smell extreme, either like body odor or ultra-oyster-y oud or something like that. I’m glad you enjoyed the footnote! Robin’s use of footnotes kind of loosened me up for them, and now I have a good time with them. When I first became interested in fragrance, I would try every new release I could. Frankly, I disliked almost everything and wasted a lot of money on samples. In the end, the fragrances I usually like are more often than not from the same houses I patronised before I got into the fragrance blogs – Hermes (almost everything), Bulgari (the tea fragrances), Guerlain (the classics, Ode a la Vanille series), Chanel (Les Exclusifs), Dior (Diorissimo, Diorella, Eau Fraiche)… the pedigreed design houses. I’ve mostly given up on niche fragrances. So many, so expensive, rarely memorable and worth the money. I really think that all the drek devalues the artistry of the great noses. It’s gotten worse than the whole celebrity scent thing. How are all these niche companies staying afloat? By the way, I’m your middle aged long lost lifestyle twin, Angela. I love the classics, too. Maybe many of them aren’t particularly fashionable, but they’re so interesting to me, and they get more interesting the more I smell other things. And I’ll see you at Goodwill, where we can fight over that rare Delano Ames! I was intrigued by the notes lists for a few of the Liquides Imaginaires and so I checked a few of them out; I found them totally disappointing. Your line “every base note but the kitchen sink” is dead on; I found all the fragrances I tried (not including Saltus) muddled and, I don’t know how else to say it, ugly. I also find their bottles hideous, though, so self-serious and butch, like a niche Paco Rabanne, so I suppose their whole “brand” just might not appeal to me. I don’t know much about this brand, and Saltus is their only fragrance I’ve spent time with, so I don’t feel qualified to comment on Liquides Imaginaires as a whole. But, for some other brands, sometimes I feel like design and branding takes precedence over fragrance. I suppose that’s fine for some people, but if you’re a real perfume lover, it’s just plain not enough. I take your point about there being no space in perfumes like this. Is it an all-natural? It doesn’t sound like it, but that density is characteristic of all-natural fragrances which, almost by definition, are niche. I get sick of that style too. Hermes is a good antidote, as to an extent are some of the Chanel Exclusifs. I’m enjoying Chanel Boy today. I’ve been doing some Mystere as an antidote, and, of course, Ma Griffe. As you say, the classic Chanels and Hermes would do the trick, too. It was really only in sampling Saltus that I realized how my taste had changed. For all the kitchen sink thing, it’s nicely balanced and smooth, but it’s just not my thing much anymore. I learned never to read the nonsense and go right to the notes and reviews. Thanks for this one; I’ll have to pull out my sample of Saltus and give it a try. It makes me sad to think that people would dismiss all niche perfumes though, because of the glut. I think this site and others do a great job of pointing to the lines worth trying, most of whose prices are no worse than Chanel and others exclusives and whose perfumes often feel more grounded and distinctive than reformulated classics. (But not always, of course!) Hiram Green, Papillon, Vero Kern, The Different Company, Malle form the core of my new collecting habit, along with Chanel. I’d be sad if people gave up on niche altogether, too! Still, it’s not getting easier to keep up. Unfortunately, it means that we don’t always give all the niche houses a fair try. It looks like we’re fans of a lot of the same houses! Without a doubt. There are vast stretches I completely of ignore! A simple life–and simple in the best way! Ah . . . give me the simple life. I know–my kind of simple! One of the few new niche perfume houses I like is Papillon created by Liz Moores. She has done just 4 perfumes, all are lovely but my favourite is Salome. It’s punchy and then exquisite, classic chypre in the old school style. Equally as lovely is Angelique a totally different picture, a watery rose with depth and longevity. I loved the article, it so mirrored me and yes I am a middle aged woman who likes to rant and squabble who reads …. Too much and spends hours listening to music from the seventies but who also loves anything made with love and care. I like Salome, too! Sometimes a niche house is much more approachable if they aren’t overflowing with offerings. Four fragrances? I can manage that. It sounds like we have lots in common. Sounds like a line worth sampling. If you get the chance to try them, definitely do! Papillon is a great line…all four of their fragrances are really good…Salome and Angelique especially. I feel like they’re getting a lot of love, too, which is nice.